Cone snails, cone shells or cones are common names for a large group of small to large-sized extremely venomous predatory sea snails, marine gastropod molluscs. Until fairly recently, over 600 species of cone snails were all classified under one genus, Conus, in one family, the Conidae. 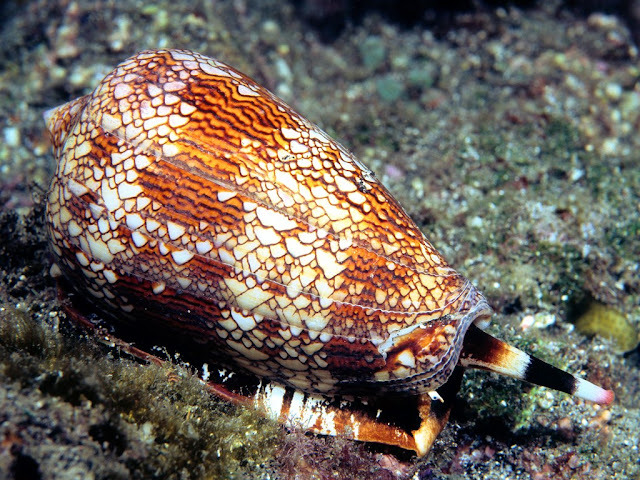 However, in recent years, it was suggested that cone snails should occupy only a subfamily that should be split into a very large number of genera. A 2014 paper attempted to stabilize a newer classification of the group, significantly reducing the number of new genera, but keeping a fairly large number of subgenera. Although the taxonomy has changed significantly several times during recent years, in the current (2015) version of the taxonomy of these snails and their close relatives, cone snails once again comprise the entire family Conidae. Geologically speaking, fossils of cone snails are known from the Eocene to the Holocene epochs. Cone snail species have shells that are shaped more or less like geometric cones. Many species have colorful patterning on the shell surface. Cone snails are almost all tropical in distribution. Because all cone snails are venomous and capable of "stinging" humans, live ones should never be handled, as their venomous sting will occur without warning and can be fatal. The species most dangerous to humans are the larger cones, which prey on small bottom-dwelling fish; the smaller species mostly hunt and eat marine worms. Cone snails use a hypodermic needle-like modified radula tooth and a venom gland to attack and paralyze their prey before engulfing it. The tooth, which is sometimes likened to a dart or a harpoon, is barbed and can be extended some distance out from the head of the snail, at the end of the proboscis. Cone snail venoms are mainly peptides. The venoms contain many different toxins that vary in their effects; some are extremely toxic. The sting of small cones is no worse than a bee sting, but the sting of a few of the larger species of tropical cone snails can be serious, occasionally even fatal to humans. Cone snail venom is showing great promise as a source of new, medically important substances.